Pendleton Outlet stores have the Pendleton quality you know at outlet prices. Welcome to the Pendleton Outlets. Find a wide selection of modern classic clothing as well as Native American-inspired jacquard blankets from America's premier weaver, Pendleton Woolen Mills. 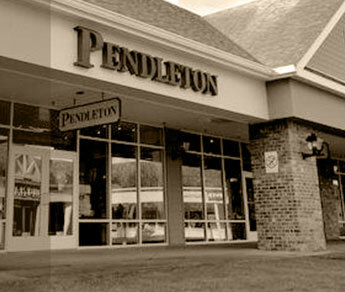 There are currently over 20 Pendleton Outlet stores across the nation. Get authentic products from Pendleton Woolen Mills at 40% - 60% below regular retail prices. Find modern classic clothing as well as renowned Native American-inspired jacquard blankets. The Pendleton Outlet stores offer special savings on jacquard blankets, fashion bedding, luxury throws, gifts and accessories. Like your local Pendleton Outlet store on Facebook to find out about current promotions.